In order to see any photo full size – just remember to simply click on the photo. 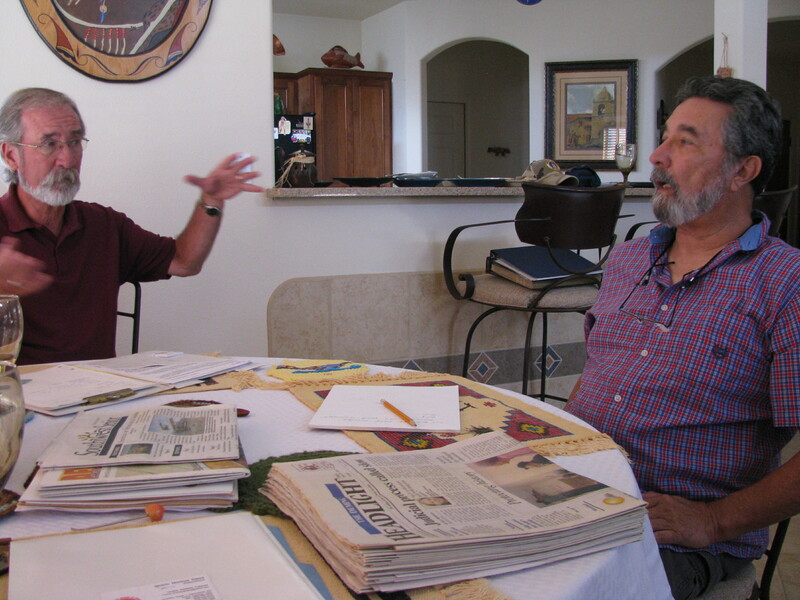 FASF VP Roy Mantei (left above) and Archive Committee Chairman, Richard Orona at work. 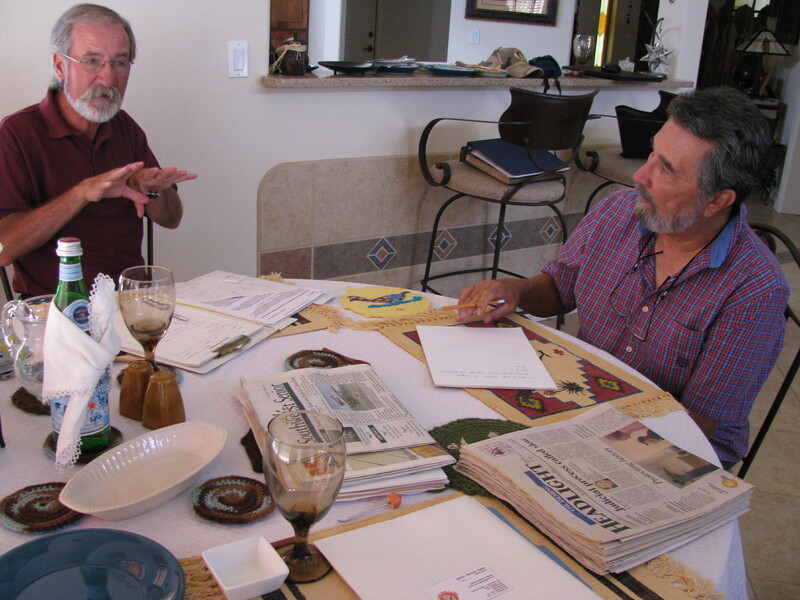 VP Roy Mantei and Archive Committee Chair, Richard Orona, are pictured in the Aerodrome staff photo above planning and organizing the new FASF archival project. All news releases and other media stories about the Foundation since the beginning of the Foundation in 2007 are being meticulously organized and archived for eventual display in the FASF Museum and for use in various FASF promotional literature during the interim. 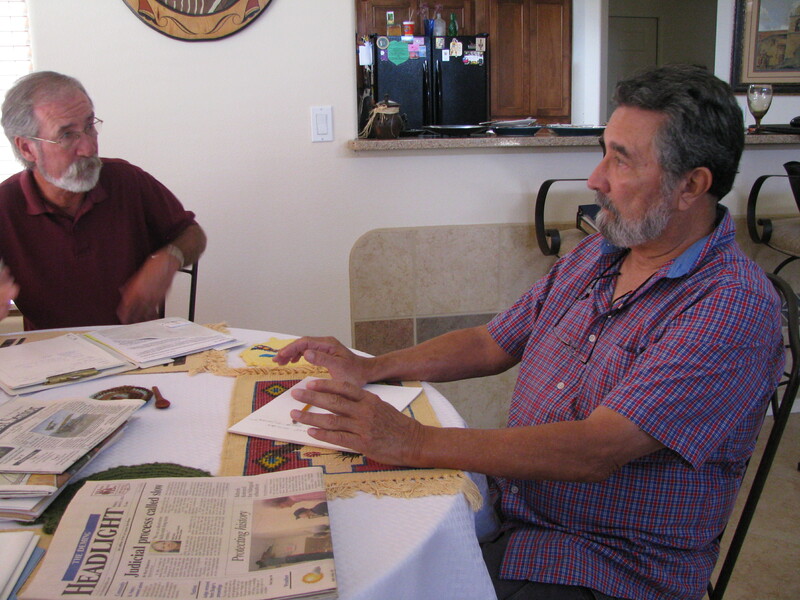 Roy and Richard are both U.S. Navy veterans, having served on active duty during the Vietnam era. Roy’s specialty was linguistics (Chinese) and Intelligence while Richard was a Crew Captain for heavy jet fighters on various Aircraft Carriers, including the USS Enterprise and USS Independence. Roy said that the influx of new talented local members like Richard has been a blessing, since there is a great deal of detail work, such they are seen doing above and at the right, that needs to be done before the year’s end. Roy reports that the new growth in our membership has been a great boost. He said he is still looking for more volunteers to help staff the upcoming NM State Fair FASF Booth. Several days are already fully staffed, but both Saturday and Sunday, the 10th and 11th of October, still have openings, so please contact Roy if you’d like to help at the Booth. You can reach Roy by calling the FASF local telephone: (575) 519-1100 Please give him a call if you can possibly help staff our Fair Booth. This entry was posted in HOT NEWS! on September 30, 2015 by FASFRIC. What is up for the 100th Anniversary at Columbus, New Mexico? I know several folks who will be going down for the weekend. 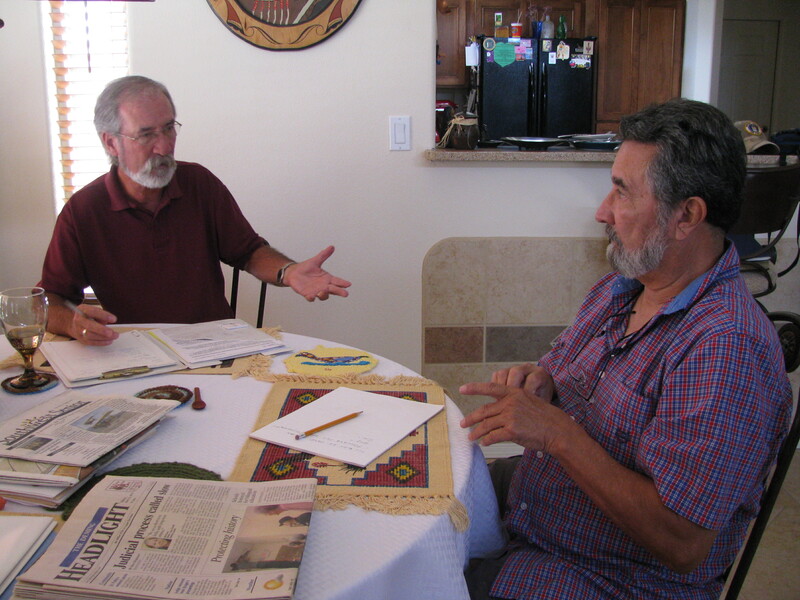 Lots of activities in the planning stages: Fly Overs – Army Chopper Demos – re-enactors from six states – cabalgata with horsemen from distant parts of Mexico traveling sometimes more than a week on horseback – Lectures – Power Point slide shows – antique vehicle displays and demos, etc., etc. Those just come to mind right now off the top of my head, but there will be more activities. Glad you’re coming! I appreciate the nice write up.